Scientists and dignitaries from North America, Europe, and Chile broke ground today (Thursday, November 6, 2003) on what will be the world's largest, most sensitive radio telescope operating at millimeter wavelengths. ALMA - the Atacama Large Millimeter Array - will be a single instrument composed of 64 high-precision antennas located on the Chajnantor plain of the Chilean Andes in the District of San Pedro de Atacama, 16,500 feet (5,000 meters) above sea level. ALMA's primary function will be to observe and image with unprecedented clarity the enigmatic cold regions of the Universe, which are optically dark, yet shine brightly in the millimeter portion of the electromagnetic spectrum. The Atacama Large Millimeter Array is an international astronomy facility. ALMA is an equal partnership between Europe and North America, in cooperation with the Republic of Chile, and is funded in North America by the U.S. National Science Foundation (NSF) in cooperation with the National Research Council of Canada (NRC), and in Europe by the European Southern Observatory (ESO) and Spain. ALMA construction and operations are led on behalf of North America by the National Radio Astronomy Observatory (NRAO), which is managed by Associated Universities, Inc. (AUI), and on behalf of Europe by ESO. "The U.S. National Science Foundation joins today with our North American partner, Canada, and with the European Southern Observatory, Spain, and Chile to prepare for a spectacular new instrument," said Dr. Rita Colwell, director of the U.S. National Science Foundation. "The Atacama Large Millimeter Array will expand our vision of the Universe with "eyes" that pierce the shrouded mantles of space through which light cannot penetrate." Wayne Van Citters, Division Director for the NSF's Division of Astronomical Sciences represented Dr. Colwell at this ceremony. "ALMA will be a giant leap forward for our studies of this relatively little explored spectral window towards the Universe," said Dr. Catherine Cesarsky, Director General of ESO. "With ESO leading the European part of this ambitious and forward-looking project, the impact of ALMA will be felt in wide circles on our continent. Together with our partners in North America and Chile, we are all looking forward to the truly outstanding opportunities that will be offered by ALMA, also to young scientists and engineers." ALMA will receive millimeter and sub-millimeter wavelength electromagnetic radiation from space. This portion of the spectrum, which is more energetic than most radio waves yet less energetic than visible and infrared light, holds the key to understanding a great variety of fundamental processes, including planet and star formation, and the formation and evolution of galaxies and galaxy clusters in the early Universe. The possibility to detect emission from organic and other molecules in space is of particularly high interest. "ALMA will push the limits of engineering to provide a telescope array at a fantastic site for astronomers to peer at the beginnings of the Universe, galaxies, stars and planets, and perhaps even life," said Dr. Fred K.Y. Lo, director of the National Radio Astronomy Observatory (NRAO). The millimeter and sub-millimeter radiation that ALMA will study is able to penetrate the vast clouds of dust and gas that populate interstellar and intergalactic space, revealing previously hidden details about astronomical objects. This energy, however, is blocked by atmospheric moisture here on Earth. To conduct research in this critical portion of the spectrum, astronomers need a site that is very dry, and preferably at a very high altitude where the atmosphere is thinner. Extensive tests showed that the sky above the high-altitude Chajnantor plain in the Atacama Desert has the unsurpassed clarity and stability needed to perform efficient observations with ALMA. ALMA will be the highest altitude, full-time ground-based observatory in the world. Work at this altitude, however, is very challenging. To help ensure the safety of the scientists and engineers at ALMA, operations will be conducted from the Operations Support Facility, a compound located close to the cities of Toconao and San Pedro de Atacama, which is at a more comfortable 2,900 meters (9,500 feet) above sea level. 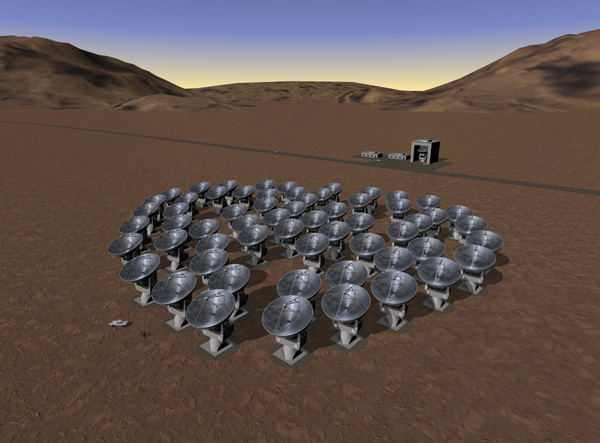 Phase 1 of the ALMA Project, which included the design and development, was completed in 2002. The beginning of Phase 2 of this project happened on February 25, 2003, when the NSF and ESO signed an agreement to construct and operate ALMA. Construction will continue until 2012; however, initial scientific observations are planned in 2007, with a partial array of the first antennas. ALMA's operation will progressively increase until 2012 with the installation of the remaining antennas. The entire project will cost approximately $552 million U.S. (in FY 2000 dollars). Earlier this year, the ALMA Board selected Professor Massimo Tarenghi, formerly manager of ESO's VLT (Very Large Telescope) Project, to become ALMA Director. He is confident that he and his team will succeed. "We may have a lot of hard work in front of us," he said, "but all of us in the team are excited about this unique project. We are ready to work for the international astronomical community and to provide them in due time with a unique instrument allowing trailblazing research projects in many different fields of modern astrophysics." ALMA will be composed of 64 high-precision antennas, each 12 meters in diameter. The ALMA antennas can be repositioned, allowing the telescope to function much like the zoom lens on a camera. At its largest, ALMA will be 14 kilometers (8.7 miles) across. This will allow the telescope to observe the fine-scale details of astronomical objects. At its smallest, approximately 150 meters (492 feet) across, ALMA will be able to study the large-scale structures of these same objects. ALMA will function as an interferometer, meaning it will combine the signals from all its antennas (two at a time) to simulate a telescope the size of the distance between the antennas. With 64 antennas, ALMA will generate 2016 individual antenna pairs (baselines) during its observations. To handle this much data, ALMA will rely on a very powerful, specialized computer called a correlator, which will perform 16,000 million-million operations per second. Currently, the two prototype ALMA antennas are undergoing rigorous testing at the NRAO's Very Large Array site, near Socorro, New Mexico. For this ambitious project, ALMA has become a joint effort among several nations and scientific institutions. This will be the first truly global project of ground-based astronomy, an essential development in view of the increasing technological sophistication and the high costs of the front line astronomy installations. "Today marks the official start of construction," said Dr. Colwell. "But the ALMA partnership also breaks ground with a novel collaboration that ensures equal access by astronomers on at least three continents. International partnerships are quickly becoming the norm of the millennium, enabling organizations and nations to combine funds to achieve greater scientific capability. NSF is proud to participate in the creation of an instrument that will provide unprecedented power for science and immeasurable knowledge for all." At the groundbreaking in Chile, the ALMA partners unveiled the ALMA logo. NOTE: A brochure on ALMA is available in pdf format.